Have a go at making these ombre pancakes to really impress your loved ones. Not only do they look amazing but they taste incredible too. A sprinkle of Superberries in the batter adds a burst of colour and berry flavour. Combine the flour, baking powder, and salt in a large bowl. Whisk together and then add the melted butter, maple syrup/sugar, and egg. Divide the mixture into three bowls. The first bowl will stay plain. Into the second bowl add a heaped tablespoon of the raspberries and 1 tsp of Superberries. Add the remaining raspberries and Superberries to the third bowl. Into the first bowl with plain batter, add 85ml of milk and mix until just combined. Don't overmix. The mixture should be thick but pourable. Into the second bowl, add 50ml of milk mixed with ¼ teaspoon of vinegar (this helps the pink colour to stay vibrant) and gently mix together until just combined. Add 40ml of milk mixed with ¼ teaspoon vinegar to the third bowl. Heat a non-stick pan over a medium heat and add a bit of butter. Once melted, use a ladle to pour the batter into the pan. Each bowl makes 2 pancakes. Flip when bubbles begin to appear on the surface of the pancake. 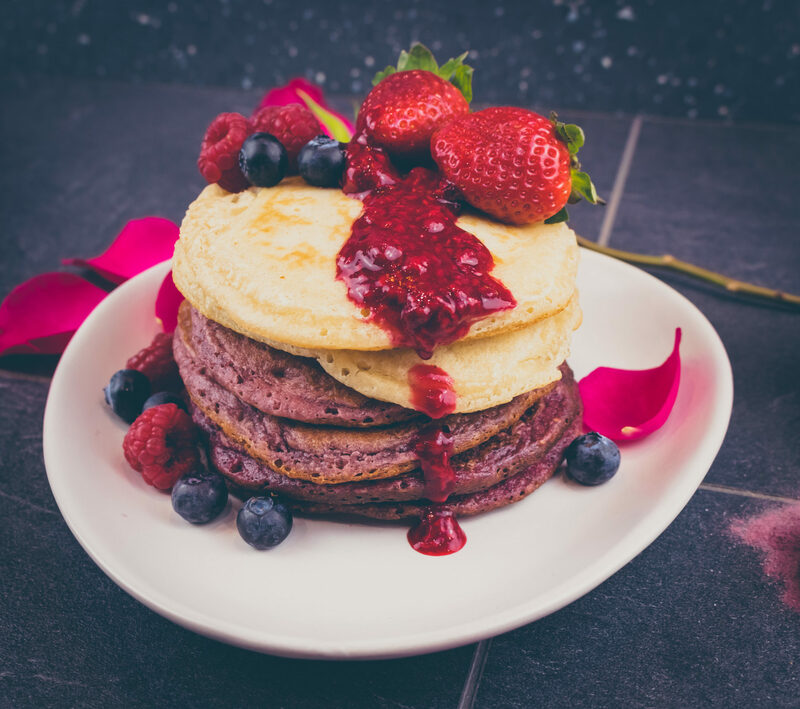 To serve, stack pancakes by colour and top with fresh berries and maple syrup.